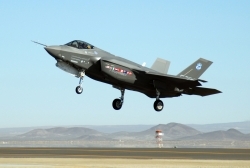 TORONTO—Classified cables released in December 2010 revealed an exhaustive American campaign to pressure Norway to buy a fleet of US-made F-35 Joint Strike Fighter jets. As the Canadian government looks to spend at least $16 billion on its own fleet of the controversial aircraft, it appears a similar campaign is underway here. The American diplomat who filed the cables—cables which detail high-level diplomatic pressure on the Norwegian government and a media campaign to sway public opinion—is now based in Canada. Several of the tactics his cables recommend have recent parallels in this country, where the government is promoting the sole-sourced purchase as a done deal but has not signed an official contract. Kevin Johnson, former Deputy Chief of Mission at the US Embassy in Oslo, was named US Consul General to Toronto in August 2009—nine months after Norway announced it would buy a fleet of the Lockheed Martin-made stealth bombers. His name appears on several classified American cables released through Wikileaks last year. Written over four months in late 2008, the cables advised the US state department to put pressure on Norway to ensure the sale while avoiding any appearance of doing so. A memo copied to the US embassy in Ottawa offered advice on how to replicate the campaign’s success in other countries. In one leaked memo, titled “Lesson Learned From Norwegian Decision To Buy JSF,” United States embassy officials claimed the Norwegian government asked its American counterpart to publicly deny US officials had exerted pressure in the sale. The document also noted that the rival Saab Gripen bid offered superior benefits for Norwegian industries. It stated Norway chose the F-35 despite the jet's high price tag—double that of the Gripen. Norway’s decision was a significant victory for the JSF program, and followed three months of lobbying subtly in public, forcefully behind closed doors. In a cable sent September 22, 2008, the US Embassy in Oslo asked the US Secretary of State, the Joint Chiefs of Staff and several US embassies in Scandinavia to ensure Norway understood that diplomatic relations between the two countries would be affected by the choice. The document’s author expressed concern that the F-35 was losing favour in the eyes of Norwegians. “High-level Washington advocacy on this issue is needed to help reverse this trend,” the cable reads. A public affairs officer from the American consulate in Toronto, Barbara Jafelice, declined to discuss the cables or Johnson’s relation to them, saying it was against policy to comment on anything Wikileaks-related. In an email, an unnamed public affairs officer from the consulate implied there was nothing abnormal about Johnson’s transfer, saying Foreign Service officers are typically moved to a new post approximately every three years. The United States embassy in Ottawa declined The Dominion ’s request for an interview. The dryly written cables from Oslo’s US embassy reveal much about how the US pressured Norway to buy the F-35. The Norwegian government announced its decision to buy the planes November 20, 2008, nearly a month earlier than expected, although it has not yet signed a contract. The October memo noted the influence Norway's decision would have on the other participants in the JSF development program, countries including the United Kingdom, Italy, the Netherlands, Canada, Turkey, Australia, Israel and Singapore. “Norway will be the first JSF partner to make a choice on the plane and thus will disproportionally affect other partners' choices,” it read. The “lessons learned” cable, sent December 16, 2008, encouraged other embassies campaigning on the JSF’s behalf to exert more than diplomatic pressure. It suggested off-the-record discussions with media outlets’ editorial boards, fielding supportive newspaper editorials written by military figures and hosting public speaking events tailored to shine a favourable light on the aircraft. The cable was copied to US embassies in several governments considering the jets, including Ottawa. “Having a socialist government like Norway’s choose the JSF is an even more powerful symbol than if a right-wing government of another country had gone first,” it added. If the tactics used in Norway seem familiar, it’s because many of them are being used in Canada, anti-war activist Tamara Lorincz told The Dominion . A member of the Halifax Peace Coalition and part of a group organizing a national March 3 rally against the jet purchase, Lorincz pointed to a string of government speaking engagements promoting the sole-sourced deal with Lockheed Martin. “It’s almost unheard of, to have Minister of Public Works Rona Ambrose, [Industry Minister] Tony Clement and [Defence Minister] Peter McKay criss-crossing the country to try to build support for the F-35,” said Lorincz, a former NDP candidate in the Halifax West riding. She attended an F-35 forum hosted by Dalhousie University’s Centre for Foreign Policy Studies on November 26, led by two members of the Department of National Defence (DND) procurement division and two members of the air force. The event was part of a string of similar engagements across the country promoting what will be the largest military purchase in Canadian history. The Department of National Defence spent more than $130,000 on the tour, one media announcement and an industry trip to a Lockheed Martin facility in Texas, according to federal documents recently released by the Liberal Party of Canada. The documents, obtained by The Globe and Mail , also revealed that Industry Canada has spent $55,000 on foreign and domestic trips to promote the jet purchase. The jets themselves are expected to cost at least $9 billion, with at least $7 billion in maintenance costs. In late January, US Secretary of Defense Robert M. Gates visited Ottawa to publicly push for the planes at a press conference with Minister McKay. Meanwhile, the F-35 debate has been raging in Canada’s media. Stories by mainstream and alternative outlets have critiqued the sole-sourced contract, continued delays in the development process and the high cost to taxpayers, while government- and military-penned editorials have defended the planes. On January 26, The Ottawa Citizen ran an op-ed titled “The truth about those jets,” written by retired General Paul Manson, a former Chief of the Defence Staff, and retired Lieutenant-General Angus Watt, a one-time air force commander. While attempting to debunk 10 common complaints about the F-35, its authors failed to note their connection to Lockheed Martin. Taylor noted that Chief of the Air Staff Lieutenant-General Andre Deschamps has also come to the defence of the F-35 in the media, writing that it “is the right fighter aircraft for Canada” in the Canadian Military Journal. Ministers McKay and Ambrose have also waded into the fray, fielding a response to “Ottawa off course on jets,” a letter co-written by Lorincz and Steven Staples of the Rideau Institute think-tank, published in The Chronicle Herald in December 2010. Not so, says Alan Williams, former Assistant Deputy Minister (Material) for the Department of National Defence. Williams led Canada’s military procurement division from 1999 to 2005 and says government claims that a competition was held are disingenuous. “This competition had absolutely nothing to do with the need...to determine which jet aircraft in the marketplace can meet the Canadian military requirements at the lowest life-cycle costs,” Williams told the House of Commons’ Standing Committee on National Defence in October, explaining the competition the ministers refer to was conducted by the US in 2001 to determine which company would build the jet. “Equating one competition with the other insults our intelligence,” he said. According to information posted on a DND website, Canada needs new fighters by 2016 in order to be ready for the retirement of the country’s F-18 fleet at the end of this decade. However, recent reports have revealed the Lockheed Martin stealth bomber won’t be out of its development phase until late 2016, making it unlikely that Canada’s order for 65 planes will be ready that year. Williams believes that leaves the government enough time to clearly and publicly define its requirements and launch a bidding process. When questioned about the plane’s selection, DND communications advisor Evan Koronewski directed The Dominion to the ministry’s website, which boasts of the fighter’s advanced “fifth generation” capabilities and the potential for interoperability with other NATO forces. He was unable to answer questions on the sole-sourced contract or speak to Williams’ assertion that the plane was chosen before the military had defined its requirements. Although promising to seek that information, he did not meet several agreed-upon deadlines and at press time had not provided the information. In October, the Rideau Institute’s Staples penned a report on the jet purchase called “Pilot Error: Why the F-35 stealth fighter is wrong for Canada.” Released by the Canadian Centre for Policy Alternatives, it encouraged legislators to examine the role a Canadian military plane would play, suggesting a single-engine stealth bomber wasn’t appropriate for missions such as patrolling the Arctic. Lorincz would prefer the money went to altogether different projects, such as health care, education and the environment. Saira Peesker is a Toronto-based journalist who covers politics, social justice issues and the arts. Submitted by Anonymous (not verified) on Mon, 2011-02-28 14:20. Why shouldn't a deal like this be completed? It's only taxpayer's money. And politicians can win influence with deep-pocketed defense contractors by spending other people's money. It's an unstoppable train. If we had any guts, there would be a tax protest day where we refuse to be slaves for this type of funding. Submitted by PSG (not verified) on Wed, 2011-03-02 00:39. An excellent and timely article! The F-35 is over priced and over sold. But that is par for the course in the military industrial complex. The biggest problem associated with the F-35 and similar such killing machines is that it is a killing machine. It has one purpose -- war of aggression -- and that alone should disqualify it from receiving public money. Submitted by Anonymous (not verified) on Thu, 2011-03-10 23:19.
great article... and very frightening information about US influence in Norway and now in Canada. It doesn't come as a surprise but is still disturbing to say the least. I hope this information gets picked up by the big newspapers as well. Submitted by Anonymous (not verified) on Thu, 2011-03-24 21:29. A unusably biased article by an anti-US writer. Some of the Canada-specific criticism is reasonable, but the way the Norway issue is presented in the article does not match the source material cited. US political pressure was only invoked as a counter to initial Swedish/SAAB political pressure, to allow a fair competition based on merit to go through. But hey, no good deed goes unpunished - and for those who think otherwise, simply read those cables and compare them to how this article characterizes them.